Going solar is not a political decision. It's about generating your own, cheap, reliable energy, reducing the burden on our energy infrastructure, and keeping more money in your pockets. The renewable energy sector employed 8.1 million people worldwide in 2015, 769,000 in the U.S. alone. Solar is the fastest growing industry in the nation, adding about 150,000 jobs/year. These are new jobs, not affecting coal (Forbes Article), or oil sector jobs (Bloomberg). Oh, by the way, we're hiring installers. We'll train you. Go America. Go Solarponics. 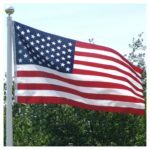 GET A FREE AMERICAN FLAG now through Jan. 20, 2017 (inauguration day), when you get a solar energy proposal from Solarponics.